Tin-glazed* earthenware was made at a number of factories in Lambeth and Vauxhall during the 17th and 18th centuries. 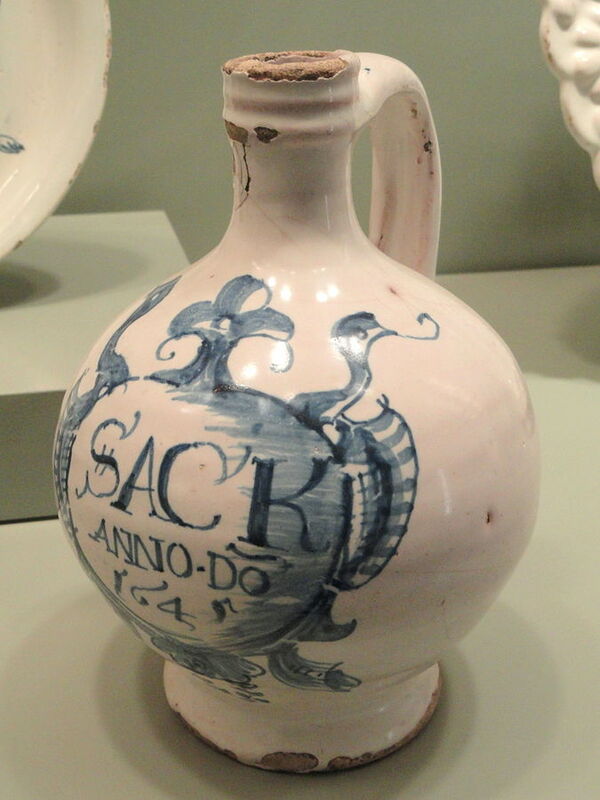 Typical 17th-century examples include wine bottles, drug pots, and ointment pots, usually decorated in blue on white. Sometimes the decoration consists of bold horizontal lines and freehand lettering, sometimes of arms, shells, masks, or cupids. Large dishes in blue, green, yellow, orange and purplish black, with biblical and other scenes, belong to this period. In the 18th century several new styles arose; the plates of this period show sketchy scenes in the Chinese manner, with figures, trees, and architectural details executed sometimes in blue only (on a white ground) but often in various combinations of the colours mentioned. The keynote of the style was free and almost slapdash brushwork: effects were achieved by hatching and bold horizontal or vertical brushstrokes. Abstract rather than naturalistic floral festoons, bunches and sprays were similarly rendered. From about 1650 to about 1780 such jars were made to order for smart apothecary shops by small potteries on the south of the Thames. The earliest Dutch potters settled in Aldgate and Southwark, but Lambeth became the leading centre in the mid-1600s. In 1680, the potter James Barston came to the former site of Norfolk House, near Lambeth High Street, and began production of tin-glazed earthenware of the type often now called ‘Lambeth Delftware’. By about 1730, there were further potteries in Lambeth High Street itself, where the Royal Pharmaceutical Society is now based. Drug storage containers and other pharmacy wares continued to be produced at Lambeth in the 1800s and 1900s, with the growth of Doulton and other new potteries. The manufacture of tin-glazed jars began to decline by about 1760. They were overtaken by cream-ware, cream coloured earthenware, produced most famously in Staffordshire, but also across England and Wales. * Tin glaze = A glaze to which tin oxide has been added to give an opaque white finish.